Get your school supplies today! Visit the 1st Day School Supplies website and you are just a few clicks away from getting everything you need for next year. It is super easy . . . Click, pay, done! Your child’s kit ships right to the school and is filled with the high quality, name brand products you trust. Plus, you will find the prices affordable! The deadline is June 30th. 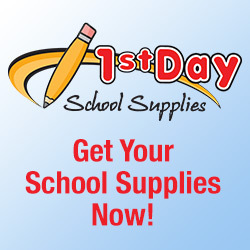 "Last Chance to Order 1st Day Supplies" only.